#4220 Quick Curl Barbie (1973) Her box included dress, clear X stand, pink brush, comb, curler, 2 ribbons, 2 bobby pins and white shoes. 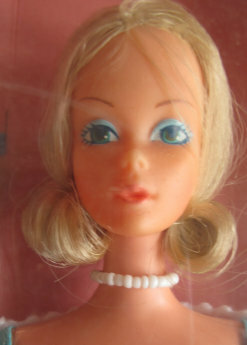 The #4220 Quick Curl Barbie was a popular doll. She had friends and family with the quick curl hair style too. There seems to be a discrepancy when it comes to her date. Some books you'll find her shown as a 1972 doll and others books says she's from 1973. Her box actually shows 1972, but she was released in 1973. 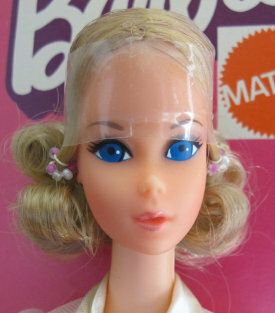 Quick Curl Barbie only had blonde hair and she came with her own curler and clips and her hair could actually curl! Her only change was in 1976 when the harder to find #9217 Deluxe Quick Curl version was released. Both are marked: © 1966/Mattel,Inc. /U.S. & Foreign/ Patented /OtherPat's/ Pending/ Made in/Taiwan. Quick Curl dolls have very teeny-tiny little wires that run through their hair which allows it to easily curl.